Zu Audio DRUID MkVI er den nyeste udgave af denne Zu Audio klassiker. Druid Mk.VI is all new: full-range drivers, tweeter, cabinet, construction methodology. Improvements over the Mk.V include improved resolution throughout the musical spectrum, and bass is significantly better, with excellent extension, articulation and shove. The new cabinet is a wood cored fiber reinforced composite complete with full filleting. Druid Mk.VI has been shown at the Munich show, Los Angeles audio show, California Audio Show, and Capital Audiofest. Srajan at 6moons, [review in progress here]. Steve Guttenburg (Audiophiliac, Tone Audio, Stereophile). Druid Mk.VI is a fifty inch [130cm] tall, seven inch [18cm] deep, floor standing loudspeaker system with a footprint of 12–3/4 inches [32.5cm] square. 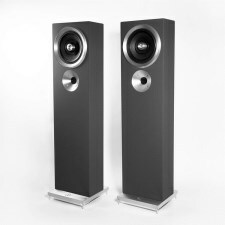 It’s a high efficiency and high power handling design and features our ten inch [26cm] full-range nanotech driver augmented by a Radian based driven tweeter assembly to color in the harmonic structure and detail of the upper most treble. Druid is capable of extraordinary power and coherent full-spectrum resolution, bass through treble, despite its relatively small size.